The soprano Eliza Illiard (born Elisabeth Pieper in Cologne) worked at the Nationaltheater in Mannheim under Herbert Maisch from 1932 to 1934. In 1933 she was the first Fiakir-Milli in Richard Strauss' "Arabella" in Dresden. Several important parts in Berlin followed. She also appeared in movies between 1934 and 1941. She married the composer, conductor and publisher Will Meisel and she was the first who interpreted his "Lach mein Herz". They had two sons, Peter (1935) and Thomas (1940). 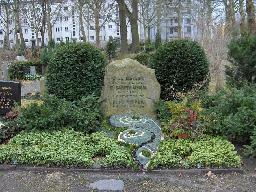 The grave of Will Meisel at the Städtischer Friedhof Wilmersdorf, Berlin.